Sen. David Vitter (R., La.) said on Thursday that while he believes the Obama administration could be preparing to sign a dangerous nuclear deal with Iran, a legislative proposal that would demand congressional oversight of that agreement is misguided. Vitter told the Washington Free Beacon in a wide-ranging interview that Iran has been "playing us out and advancing their nuclear program in the meantime" during the recent negotiations between the United States, the Islam Republic, and five other world powers. He noted that Iran has secured billions in sanctions relief throughout the duration of the talks, which have a deadline for a framework by the end of March and a comprehensive agreement by July. Some lawmakers are pushing for Congress to hold a vote on any final nuclear deal reached with Iran despite the administration’s assiduous efforts to leave Capitol Hill out of the process. A bill authored by Sen. Bob Corker (R., Tenn.), chairman of the Senate Foreign Relations Committee, would require the White House to submit a final nuclear pact to Congress five days after its completion, and then allow 60 days for lawmakers to weigh in on the agreement. However, the Senate would need 67 votes to overcome a likely presidential veto and bar Obama from ordering more congressional sanctions relief for Iran. That high threshold concerns Vitter. "Clearly the administration could benefit from something that puts the burden on us," he said. "Put the burden on us and it’s above 60 [votes], then I think you’re probably setting us up to fail," he added. Vitter was one of the signatories to an open letter sent by 47 Republican senators on Monday to Iran’s leaders. The missive suggested that a future president or Congress could revoke a nuclear deal and elicited sharp criticism from the administration and proponents of an agreement. The State Department appeared to bolster the GOP senators’ case when Secretary John Kerry asserted on Wednesday in congressional testimony that a deal would not be "a legally binding plan." Kerry insisted that such an agreement would not be subject to congressional review. Yet legal experts noted that due to the nonbinding and executive nature of a potential deal, a future administration could easily repeal it. 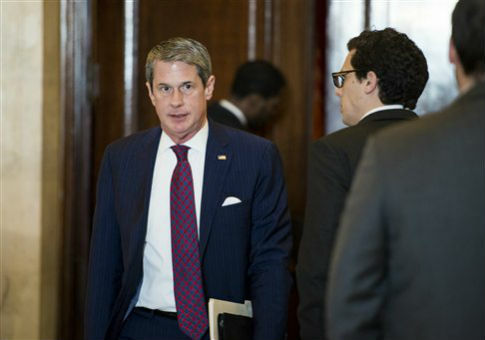 "The letter is completely fair and accurate in educating the Iranian leaders who presumably don’t know the nuances of representative democracy," Vitter said. "They certainly don’t act like they do," he added with a laugh. Vitter also discussed two other pressing national security matters—a new congressional war authorization and the defense budget. Kerry testified on Wednesday about the administration’s proposed Authorization for the Use of Military Force (AUMF) to combat the Islamic State (IS) terrorist group, along with Gen. Martin Dempsey, chairman of the Joint Chiefs of Staff, and Defense Secretary Ashton Carter. The plan has no geographic limitations on where U.S. forces could battle IS, but it does contain a three-year sunset clause and a proscription of "enduring offensive ground operations." The proposal appeared to please neither party. Democrats are worried that the new AUMF would grant the administration a "blank check" to deploy U.S. ground troops in the Middle East, while Republicans are conversely upset about the plan’s limitations and what they say is a lack of seriousness on the part of the White House in its strategy to defeat the brutal terrorist group. "No one wants American boots on the ground to have to lead the way," he said. "But I think we need to recognize this is a serious war, and airstrikes alone aren’t going to do it." Nearly two-thirds of Americans support sending U.S. ground troops to fight IS, according to a recent Quinnipiac University poll. The House and Senate are expected to vote on their budget resolutions by the end of month, which will reportedly leave sequestration caps in place. Those spending limits have been sharply criticized by defense hawks such as Sen. John McCain (R., Ariz.), who says that the nearly $1 trillion in planned cuts to the Pentagon’s budget over the next decade would hollow out the nation’s military. Vitter said he does not quite align with McCain’s view and is concerned about making the U.S. deficit larger in order to boost defense. Republicans are currently discussing other mechanisms they could insert into the budget to alleviate the defense cuts, Vitter said. "The budget should reflect the sequester," he said. "I also support changes to help defense." Budget experts note that entitlement programs, rather than the military, will be the primary driver of deficits in the next decade. This entry was posted in Politics and tagged David Vitter, Defense Budget, Islamic State, Nuclear Iran, Sequestration. Bookmark the permalink.